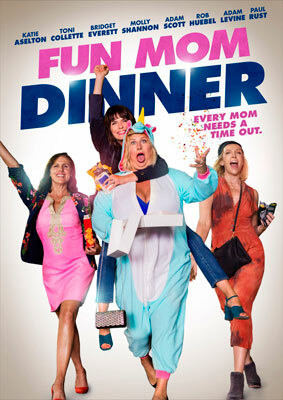 Fun Mom Dinner is a comedy about four mothers getting together for some much-needed quality time in the well-tended land of Suburbia. Molly Shannon and Toni Collette lead a cast that’s stuck on predictable, with generic white-bread women in the all-too-familiar Mommy world of stressful schedules, hyperactive children and word battles with insensitive spouses. They bond over wine, dinner, swearing and weed, mimicking the Judd Apatow sophomoric school of humor, which makes perfect sense, since the screenplay was written by Julie Rudd (whose husband, Paul Rudd, is a favorite Apatow alumni and also plays a minor role). The action doesn't get any more complicated than a bro-bonding session on parenting and the women mini-adventuring it around town. Sadly, Ms. Jones and Rudd obviously didn’t get the memo about diversity, as we’re treated to Marsai Martin from Blackish and Jaz Sinclair in possibly the shortest speaking parts for 2017. The most positive thing I can say about Fun Mom Dinner is that it’s good to see a film written and directed by two women in their film debut. These characters may be Hollywood stereotypes created on the cheap, and the director and writer may be guilty of giving us an Apatow knock-off, but that’s how the majority of male directors got their start, too. Hopefully Alethea Jones and Julie Rudd will be given the chance to direct and write more films of better quality, because after all, practice makes perfect.